Sunday, December 9, 2012 Greg Hicks, President of the Cople District Volunteer Fire Department, accepted a $500.00 check from Keith and Joanne Meenan, owners of Vault Field Vineyards in Kinsale. This donation was made possible in part by a raffle at Vault Field’s Fifth Annual Fall Barrel Tasting and Open House held Saturday, November 17st in which the grand prize was a beautiful print donated by artist David Aiken. The funds are earmarked to purchase an extractor/washer that costs approximately $5000.00. The department is in urgent need of this equipment to properly clean the firefighters’ turnout gear. Toxins from soot and smoke get absorbed into the gear making it hazardous to the health of the firemen. Since opening in 2007, Vault Field has donated a portion of their Fall and Spring Open House proceeds to the department. Meenan said, “We strongly believe in giving back to the community. 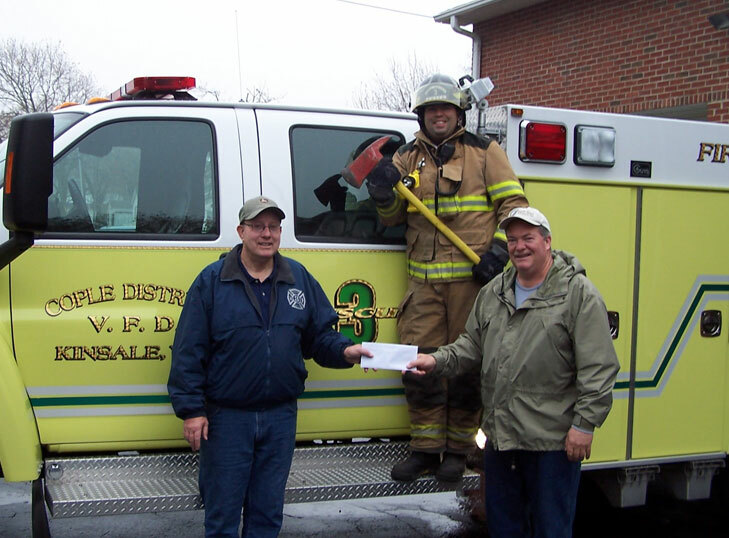 Our sincere thanks to all those who made this donation possible and we encourage others to support our volunteer firefighters in their efforts to protect us.” Your tax deductible donation can be made to: Cople District VFD, P.O. Box 51, Kinsale, VA 22488.